RG PRO Rear Suspension: RG PRO rear suspension features a “wishbone” style, trailing arm design for true tracking throughout the 16.5 inches of travel, delivering professional level performance and stability. ITP ULTRACROSS Tires: 27-inch ITP ULTRACROSS tires provide 6-ply radial construction, a tightly spaced and overlapping tread pattern that lowers rolling resistance and enhances ride comfort, and a durable rubber compound that delivers longer wear and enhanced resistance to cuts. Their super deep Rim Guard feature provides outstanding wheel lip protection. KMC Cast Aluminum Wheels: Cast-aluminum 15-in. KMC wheels are custom built just for the Wildcat X, delivering lightweight, ultimate strength and a signature style. King Adjustable Dual-Rate Shocks: King aluminum gas shocks provide compression adjustability and precise rebound damping with fade-free, race-proven performance. Digital/Analog Gauge: The digital/analog gauge provides critical operation indicators, including clock/hour meter, fuel level, mode button, set/reset button, odometer/trip, gear position, speedometer/tachometer, needle display, differential lock, high beam, battery condition, temperature and oil pressure. Variable Assist Electronic Power Steering (EPS): Arctic Cat’s Variable Assist EPS provides varying electronic steering assist depending upon conditions, effort and speed. An Electronic Control Unit measures steering input force in relation to vehicle speed and tire resistance in order to provide the appropriate assist to the steering column via an electronic brushless motor. The varying levels of assist translate into a light steering input effort, especially when in 4WD with a locked differential, but with optimal feedback so that the rider senses the tire contact with the terrain. Infinitely Adjustable Tilt Steering: A lever-activate adjustment option provides an infinite number of wheel positions within a 7.5-in. range, allowing drivers to customize their comfort based on size and conditions. Automotive-Style Paint: High-quality automotive-style paint stands up to the abuse of the trails and shines up to a showroom look with soap and a little elbow grease. Dual LED Headlights & Taillights: Vibrant LED headlights, brake lights and taillights provide outstanding illumination and visibility in low-light and nighttime conditions. The headlights feature High/Low beam. Race-Inspired Highback Bucket Seats: High-back bucket seats provide an aggressive feel as you take your machine through the paces and comfortable enough to keep you in the saddle all day long. 2/4 WD With Electric Front Differential Lock: The rugged drivetrain features High/Low range, Reverse and Park. Electronically selectable on-the-fly 2- and 4-wheeldrive is bolstered by selectable 4wd differential locking to achieve the desired traction and drive control in varying conditions. 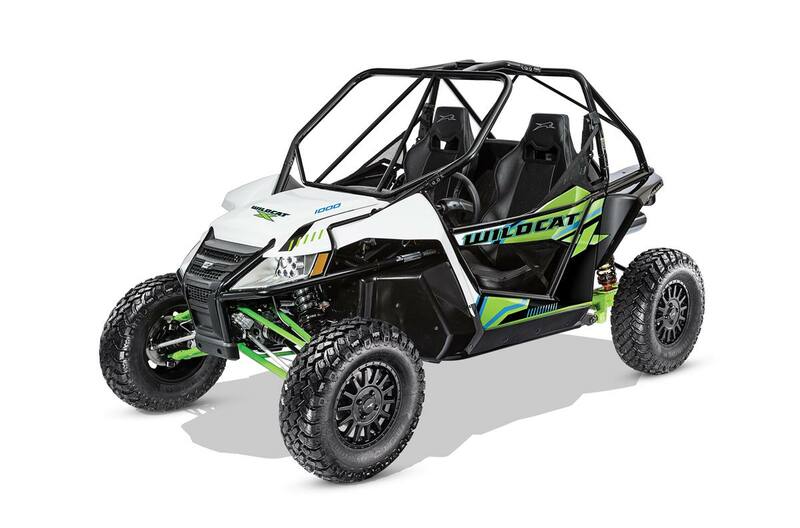 Race-Inspired ROPS Cage: An all-new ROPS cage on the Wildcat X models takes its Baja race-inspired design straight from the race machines used by Robby Gordon. It’s made from robust tubing, with additional front support braces aimed at delivering maximum rigidity and strength for driver who demand race-level performance. Four-Wheel Hydraulic Disc Brakes: Dual-piston caliper hydraulic disc brakes on each wheel deliver enhanced braking performance, feel and control in all conditions. 1000 H2 Engine: A 951cc, H2, liquid-cooled V-Twin EFI engine provides the efficiency advantages of 4 valves per cylinder with its Pentroof Hemispherical Combustion Chamber. Oxygen enters the machine though a 50mm throttle body, and leaves through a 2-into-1 tuned ceramic-coated exhaust with a new pipe and closed loop EFI system, improving your fuel efficiency. Each H2 engine is assembled at Arctic Cat’s state-of-the-art St. Cloud, Minnesota, facility. TEAM Rapid Response and Rapid Reaction Clutches: TEAM Rapid Response drive and Rapid Reaction driven clutches are renowned for their performance and durability. The drive clutch features extra-durable towers, spider and roller bearings for consistent performance. It functions in combination with the lightweight aluminum driven clutch for maximum power transfer, instant response to varying loads with minimal friction and wear. ROVs can be hazardous to operate. For your safety, all occupants must wear a seat belt, approved helmet, eye protection, and protective clothing; use handhold and stay inside vehicle. Never ride on paved surfaces or public roads. Never engage in stunt driving; riding and alcohol/drugs don’t mix and could cause serious injury or even death. Avoid excessive speeds and be particularly careful on difficult terrain. We recommend all ROV operators have a valid driver’s license. No operators under age 16. Never carry a passenger in the cargo box; the passenger must be able to place both feet on the floor while keeping their back against the back of the seat. Arctic Cat recommends that all riders read and understand their operator’s manual before operation and take a training course. For ROV training visit http://cbt.rohva.org. Along with concerned conservationists everywhere, Arctic Cat urges you to “Tread Lightly” on public and private lands. Ride only on designated areas or trails. Preserve your future riding opportunities by showing respect for the environment, local laws, and the rights of others when riding. Do not shoot from or lean firearms or bows against the ROV. ®™ are trademarks or registered trademarks of Arctic Cat Inc.